With the word "Garden" in its name, this summer cocktail is clearly the best thing to ever happen to the world of botanical libations. Look, if you put the word "Garden" in the name of a cocktail it simply has to be amazing, right?! Right. Add gin to it and it's pretty much the only thing we're ever drinking again. Oh, that's what The Garden Gimlet is?! Well, then we are officially IN! 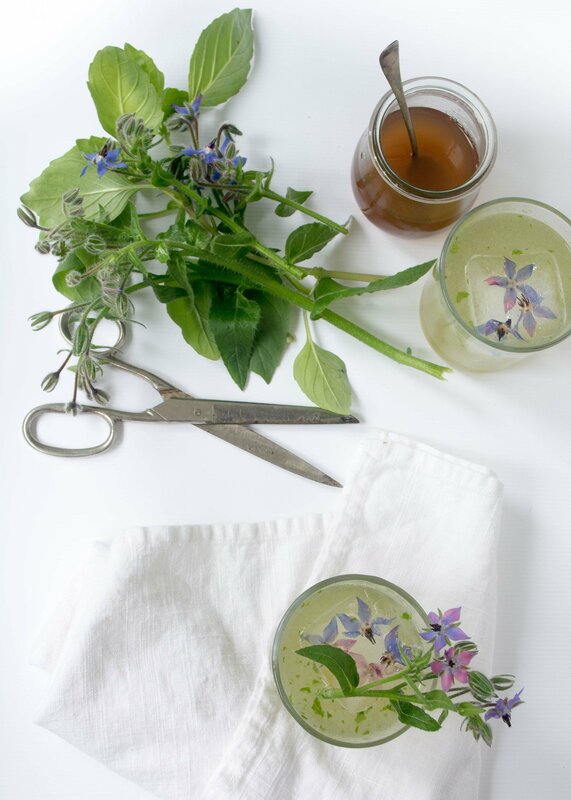 This week's perfect summer time sip comes courtesy of The Ranger's Daughter, a lovely food blogger out of Oregon, with a passion for eating well and, as it turns out, drinking pretty. The best part? She has also come up with a way to make this drink sort of, kind of good for you! 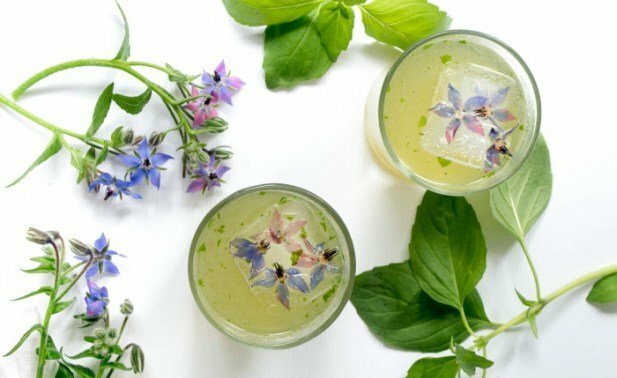 So, what we've got here is a delicious, flower-inspired summer cocktail that has ingredients that are actually beneficial to your health. Hence it's basically a health food cocktail so, you're welcome! *this recipe makes one cocktail, so clearly you will need to be doubling or tripling it depending on what sort of day it's been! Combine 1/4 cup honey and 1/4 cup water in a small saucepan and bring to a simmer over medium heat, stirring often. Combine with basil blossoms and torn basil in a heat-proof bowl and let sit for at least 1 hour. Add the basil leaves, lime juice, and simple syrup to a cocktail shaker. Using a muddler, muddle the the basil leaves in the shaker. Add the gin and fill half way with ice. Place the top on the shaker and shake vigorously for about one minute. Pour into a glass with ice and top with a splash of club soda. Now go ahead and throw back that beautiful, refreshing, and delicious beverage! 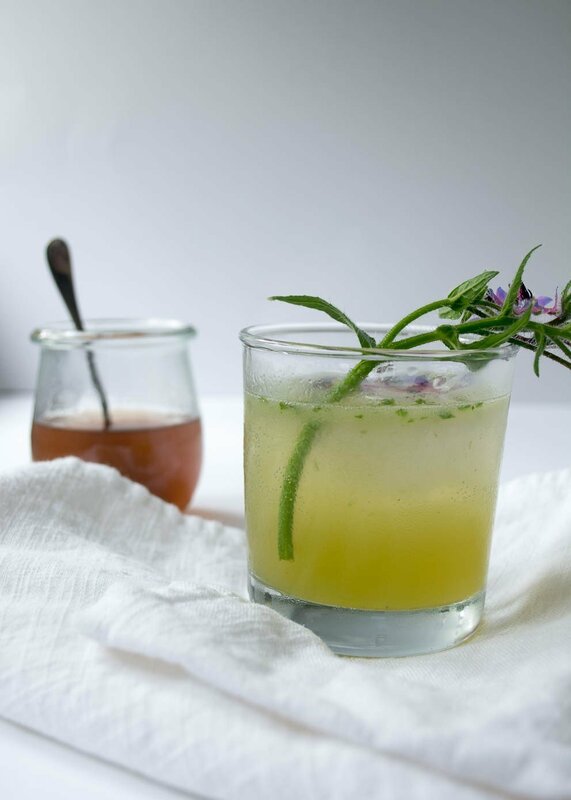 1 - The Garden Gimlet is made with honey instead of refined sugar. Honey contains less simple sugars and more complex sugars, meaning your body expends more energy processing honey than it does regular granulated sugar. This means you accumulate less calories and have lower blood sugar spikes! 2 - Honey contains trace nutrients like fiber and vitamins, and is naturally free of preservatives. 3 - Basil and borage are both high in cancer-fighting antioxidants. 4 - Basil is particularly high in several vitamins and minerals, and has anti-inflammatory properties. 5 - One of the stories of the origin of the gimlet was that it was an elixir used by sailors in the 19th century to prevent scurvy. There you have it. Not only is it completely delectable and gorgeous, you can talk yourself into a second and third round thanks to all these amazing health benefits! One final tip... 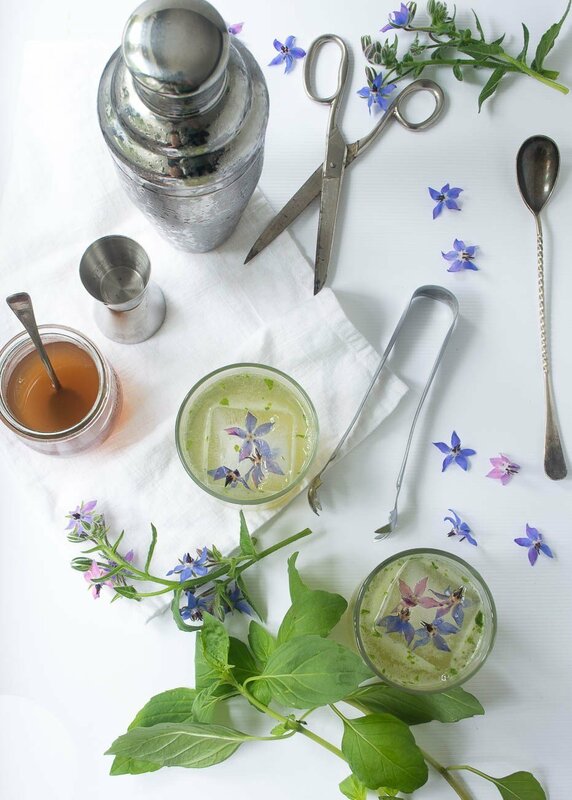 If you want your gimlet to be even more impressive, you can make your own flower-filled ice cubes! These are much easier than they look and everyone will be super impressed! Simply place an edible flower or two in each compartment of an ice tray, fill with water, and freeze. Voila! 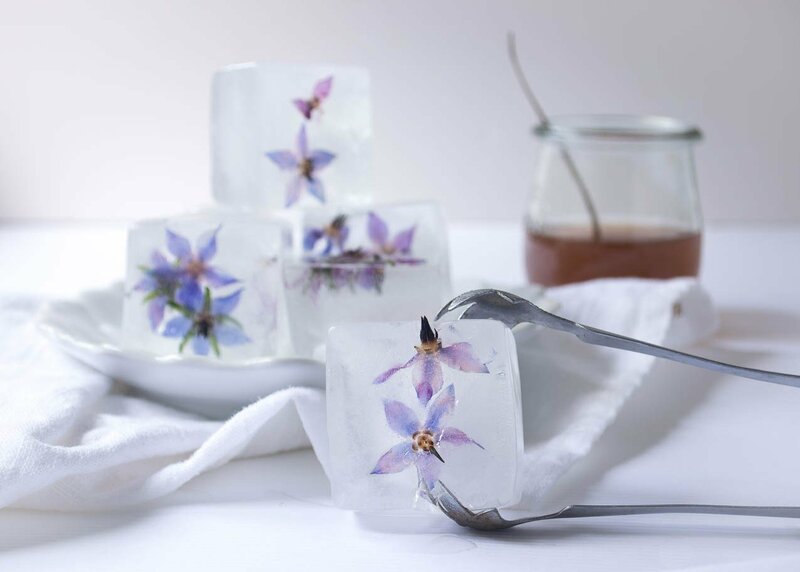 Flower-filled ice cubes! Thank you so much again to The Ranger's Daughter for the amazing recipe, inspiration, and stunning photos! *The Ranger's Daughter is Allison. She is the daughter of a park ranger and a florist, and her blog shares her insights into eating well and her philosophy that every meal is an opportunity to increase one's well-being. 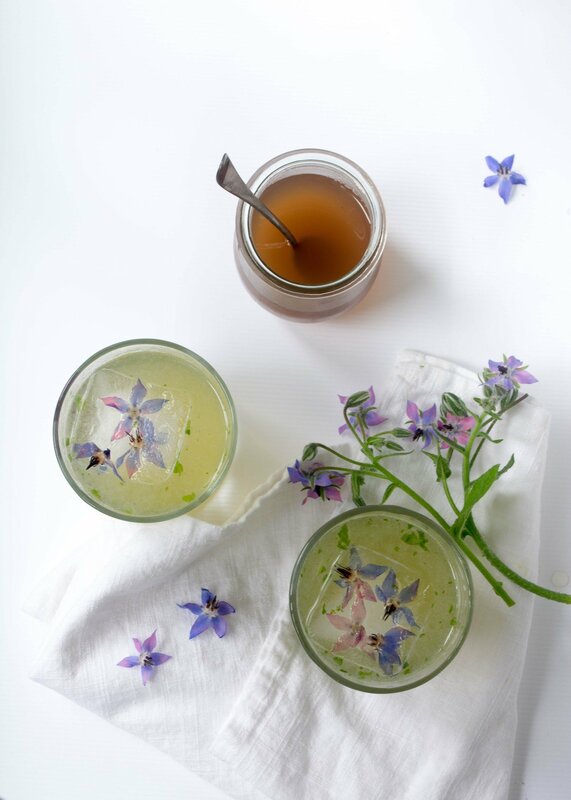 She came up with this deliciousness after discovering the recipe for a Borage and Basil Simple Syrup in Cooking with Flowers by Miche Bacher. And obviously we are now completely in love with her.